GRAFENWOEHR, Germany — As part of Netzaberg Elementary School’s Kindness Challenge, NES students participated in spreading kindness and holiday cheer in several ways this season. First, NES students partnered up with H.A.L.O.S., or Humanos Ayudando Los Oprimidos y Sufridos, in an annual toy drive to raise the holiday spirits of locally-hospitalized children undergoing cancer treatment. The clinic, located in Nuremburg, treats little patients as young as newborn up to 18 years. 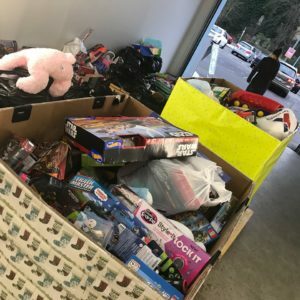 The students and staff collected new unopened toys and stuff animals for kids to make their holiday more enjoyable. This year, NES students matched last year’s amazing toy drive by collecting more than 250 toys and stuffed animals. The toy drive was sponsored by NES host nation teachers. The host nation program provides DoDEA elementary school students with a cross-cultural and language acquisition focus to develop an appreciation and understanding of the culture and language of the country in which they are located. NES students also created crafts and pictures that are now displayed at the clinic, library and Exchange gas stations at Tower Barracks. NES promotes creativity and innovation as an important contemporary skill for students. The works of art display the students’ originality and helps them make unique connections to their holiday experiences. When students create and present their art, they learn that the arts are part of basic human communication and connect how to use the arts to respond to the world around them. On Dec. 12, NES music department hosted the Winter Concert. The well-attended event showcased the talents of the NES students in first, second and third grades. Students performed songs and synchronized movements that delighted and raised the holiday cheer for all. More than 300 parents and visitors attended this event. NES Winter Concert supports the curriculum goals of DoDEA’s music program by having students participate in various forms of musical expression and creates an awareness of the interrelationship between music and society. Music is a vital part of any society’s heritage. Hearing and performing a variety of diverse music helps one to understand the role music has played and continues to play in the lives of all humans.